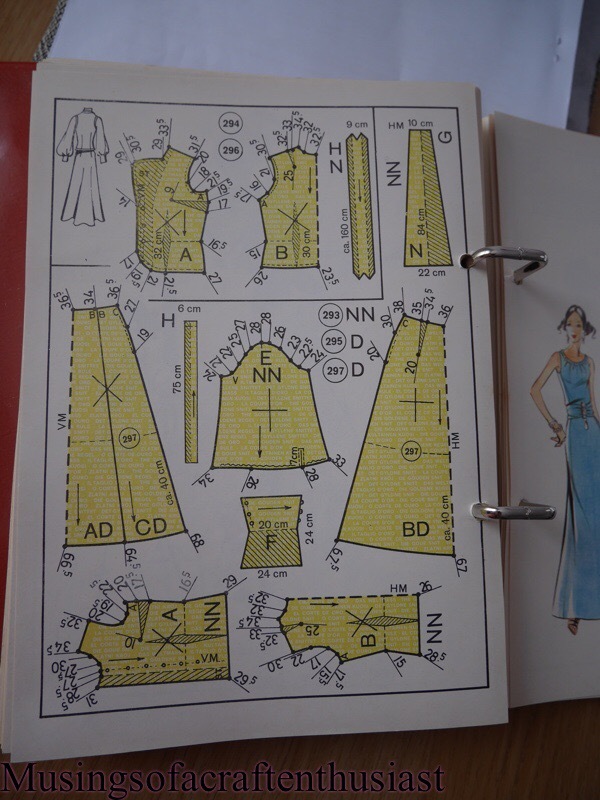 I came across an interesting piece of information while reading my haslam book of dressmaking, no wonder the sleeve looked a bit weird and pully across the front, apparently you don’t line up the under arm seam with the under sleeve seam. 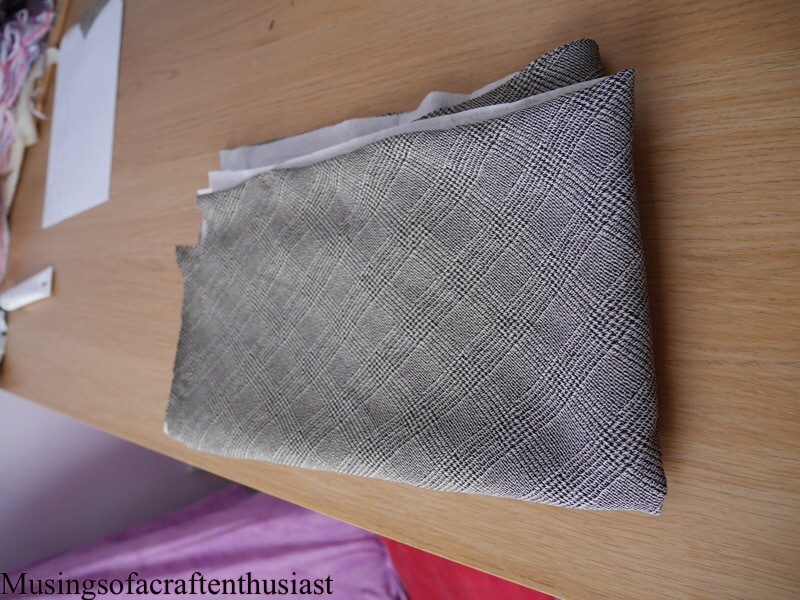 I must admit after I removed the sleeve and reinserted it as per the instructions (which was also in the front of the drafting leaflet) it actually sat a lot better. 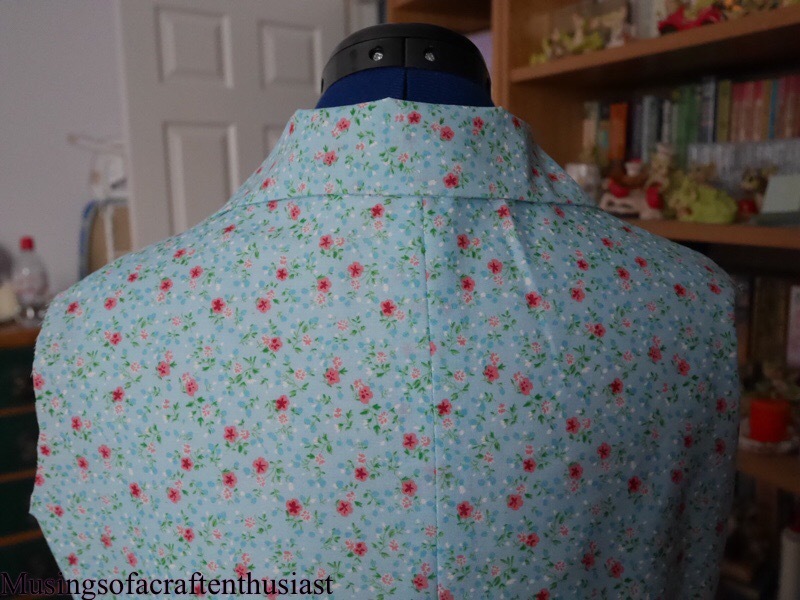 The facings and the collar have been inserted, the blouse is looking very good, I’m still not certain that I would wear in this coloured fabric but the blouse is wearable and the correct size. 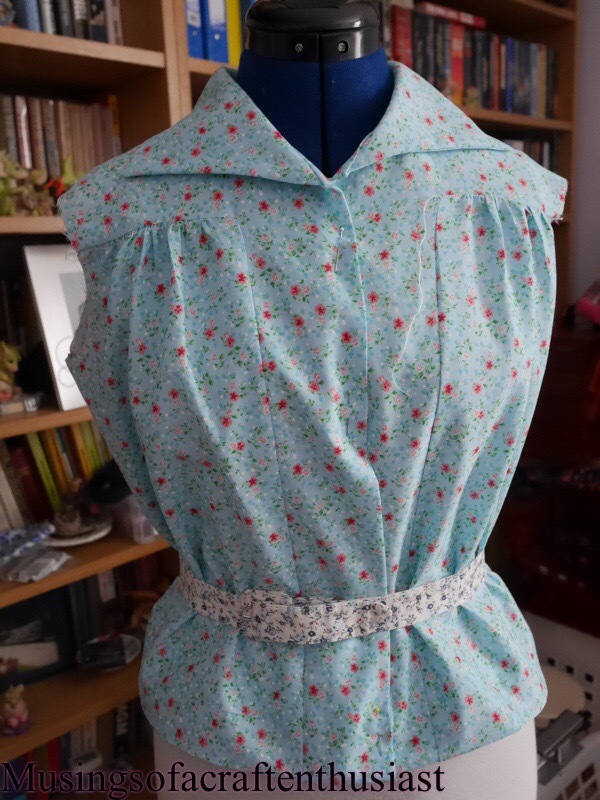 Of course at this point I’m wishing I hadn’t done a shoulderectomy on my dressmaking dummy as the blouse was a bit droopy, but I soon fixed that with a couple of bits of card stuffed under the t-shirt. 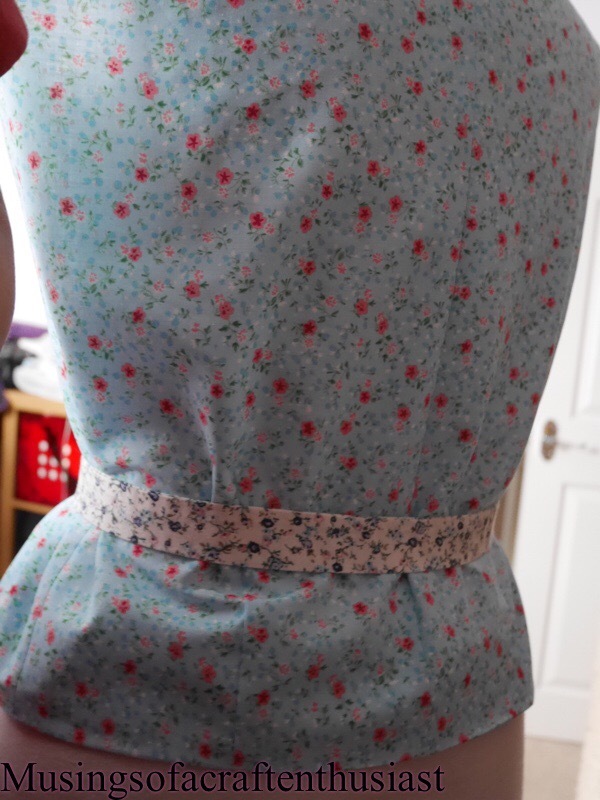 The Collar looks a little bit wonky but I’m not sure if it is just the way that I have attached it or if the picture is off slightly. 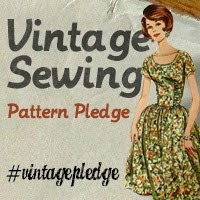 The next step is to find a nice lightweight fabric and make one that will be nice to wear to work. 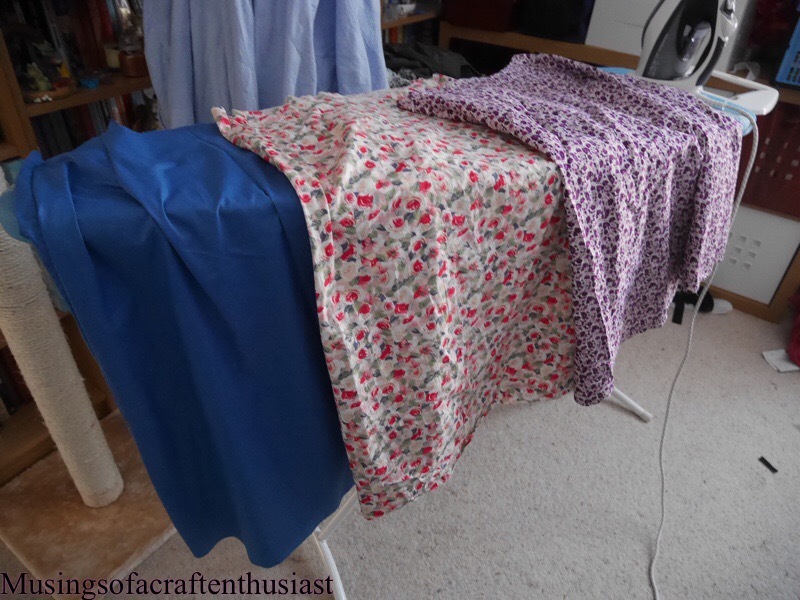 Ok, I have made my Blouse, it went together very easily, no funny, I’m not sure what that bit is doing…. 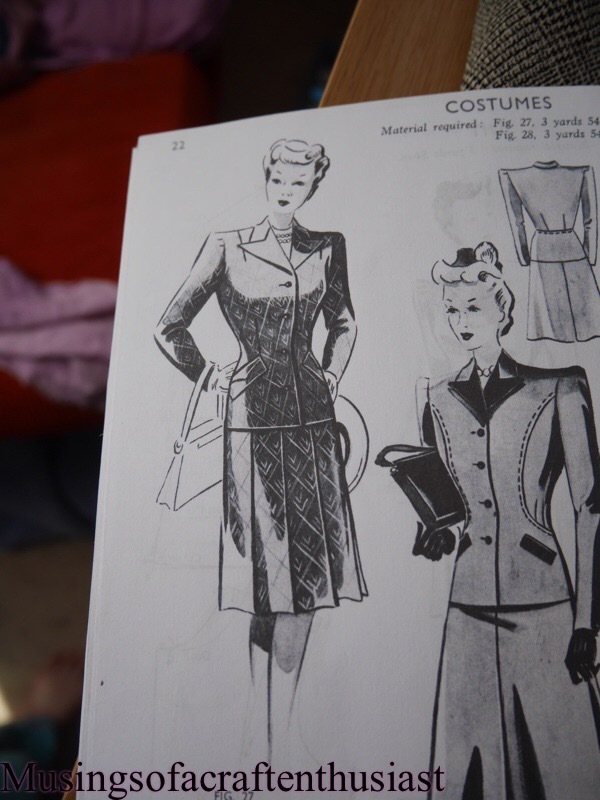 There are a couple of problems, one of which is to do with measuring and two, the ladies of the 40s must have been a darned funny shape in the hip/stomach region. 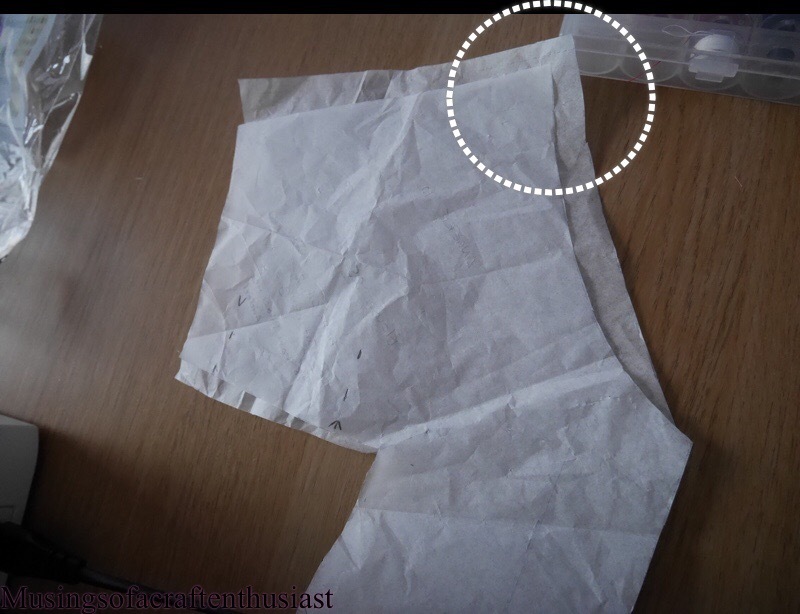 Item one – either I mis-measured my shoulder or I didn’t quite understand what the foundation booklet wanted. I measured my shoulder at 4 1/2 inches it wasn’t wide enough, when I measured it a second time I carefully read the instructions ‘measure from the prominent bone in your neck to the point of your shoulder bone then take 2 1/2 inches away’ after a re-measure it turns out that maybe it should be 5 1/2 inches, this actually corrects half of the problems I had with the blouse. 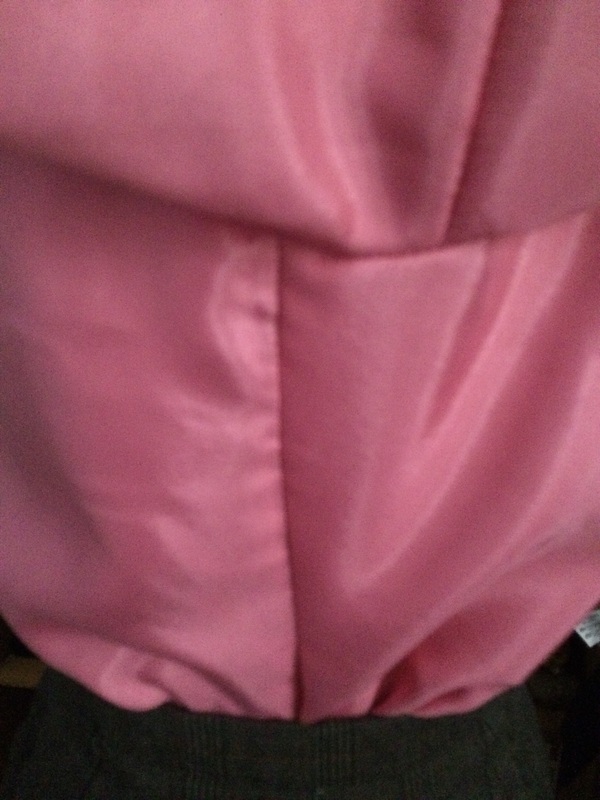 Item two – The hem of the back of the blouse wasn’t wide enough. 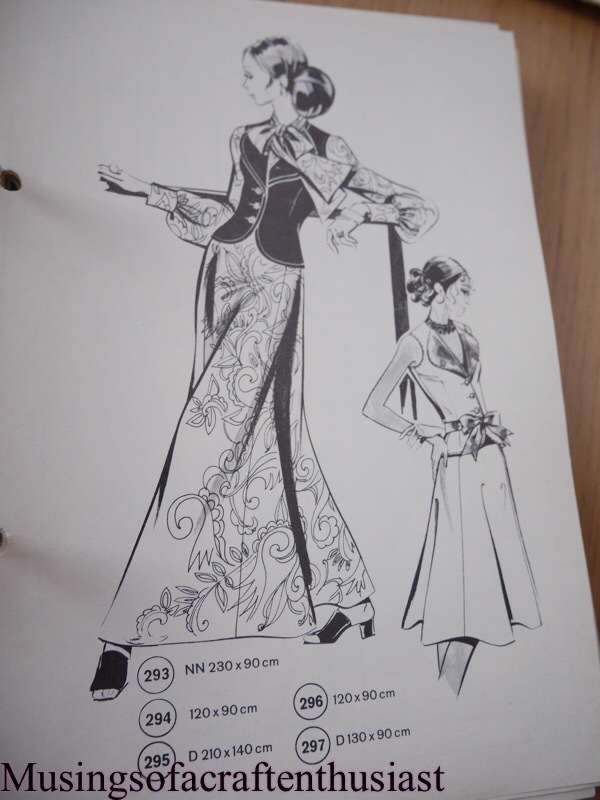 I was going on the assumption that the side seams of the blouse should fall level with my under arms. Wrong!!! 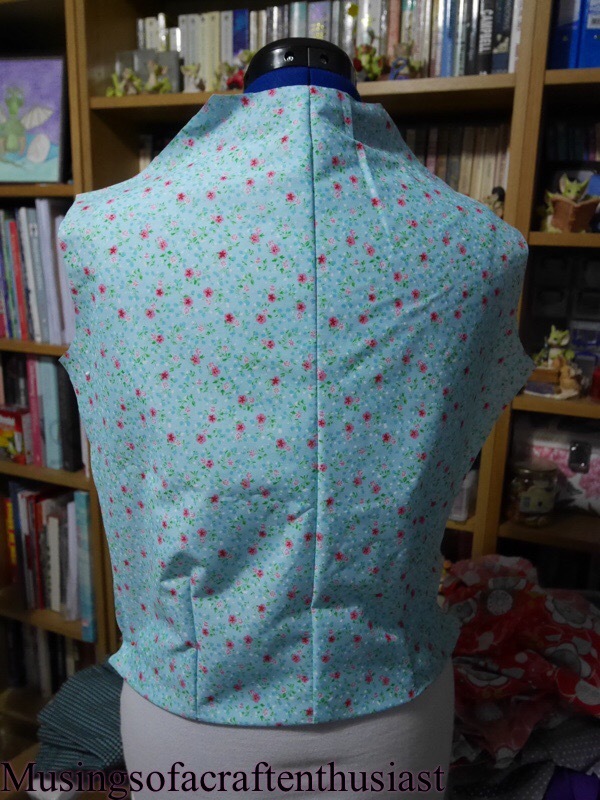 If I held one side level with where you would expect a side seam the other side was at least an inch out, maybe a bit more. 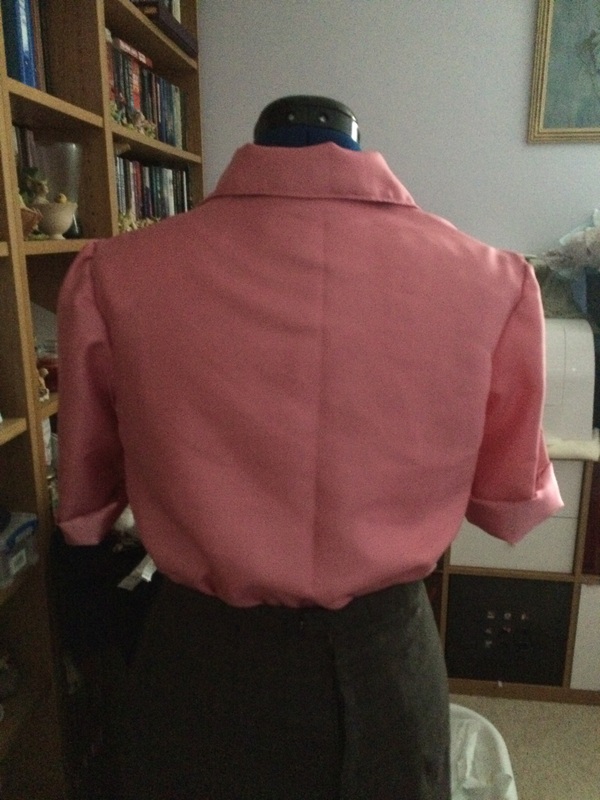 Also I had a lot of fabric in the front, when I say a lot, each front nearly went from one side seam to the other. 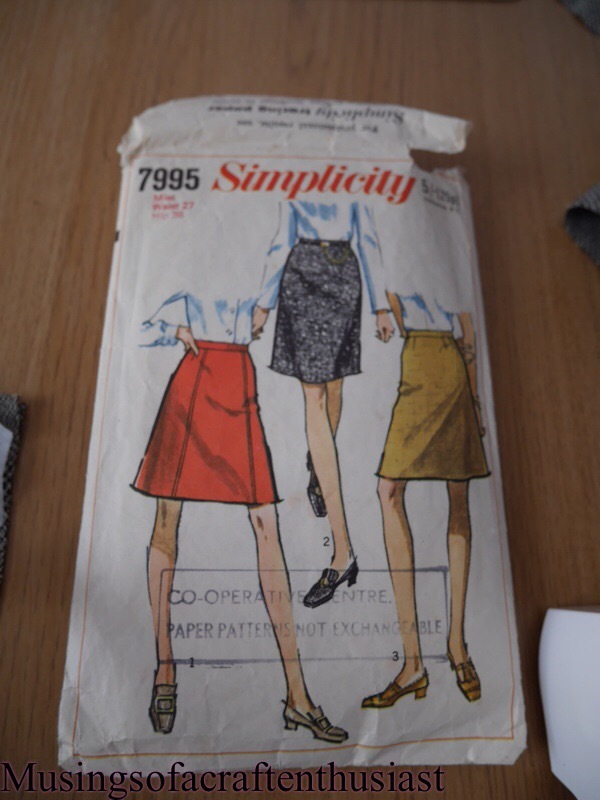 Looking at the instructions you can see why this would happen, you take the hip measurement and quarter it, then you add an inch to the front, the back you deduct an inch. 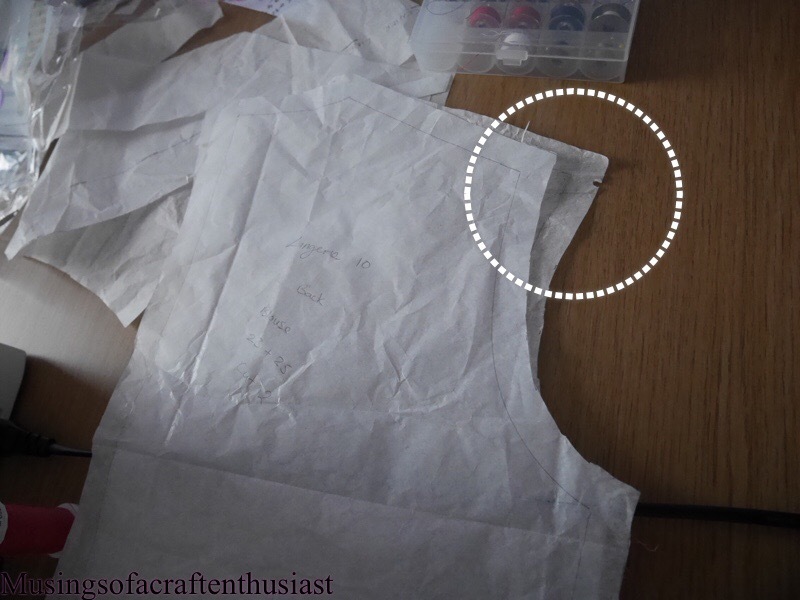 On the bodice sloper craftsy class I have, you do something similar but only with 1/4 inch. May be I should have done this but I went the other way I measured my hips then I split the measurement up as my body split it up. 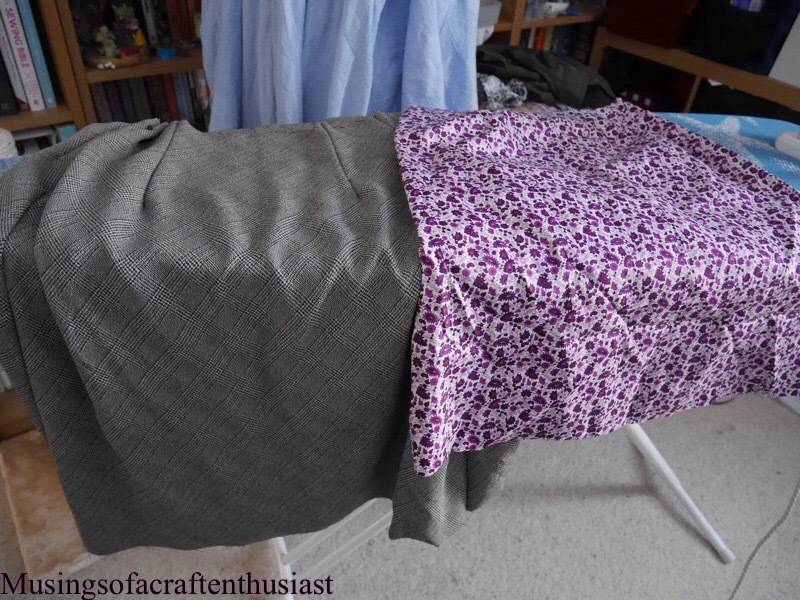 There was one other problem but that was connected to my fabric choice, I used a piece of poly cotton which was a bit stiff and I think the fabric should have a lot more drape to it. 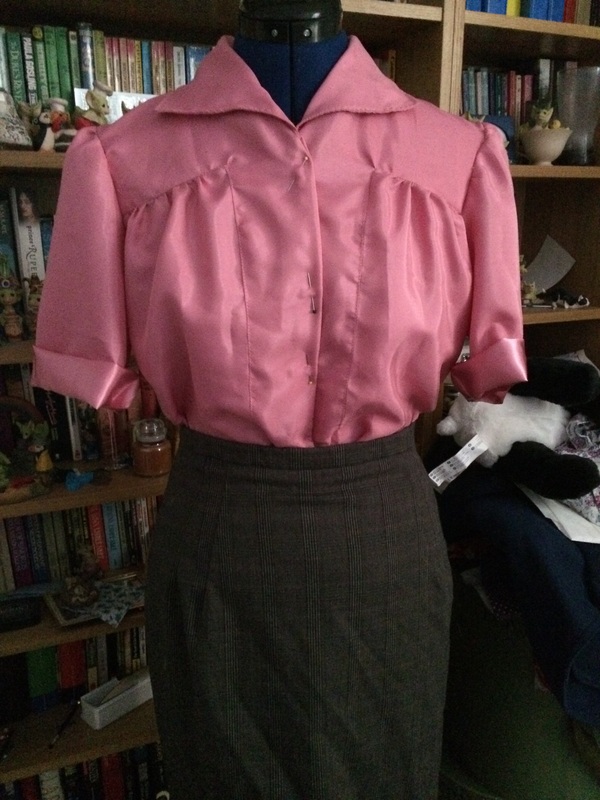 As it was the blouse looked very boxy and was quite uncomfortable across the back and sleeves, (this should be fixed by the nearly 3 inches added to the back piece across the shoulders). 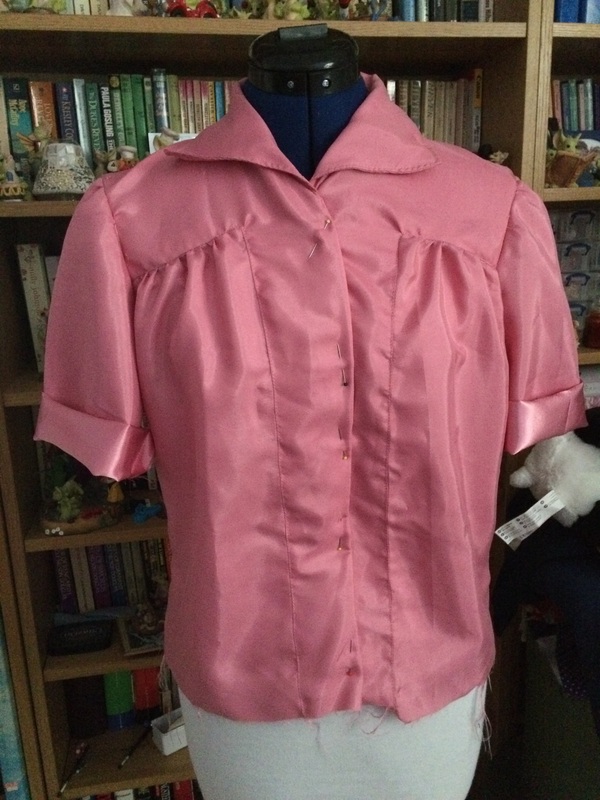 I have redrafted the pattern pieces and cut them out in some sort of pink shiny fabric, that I’m not sure why I bought it the colour is totally not what I would wear.